☆Dual USB charging ports, in case you have more than one smartphone. ☆Blu-ray LED displays FM channels and real-time monitoring of automotive voltage intelligently. ☆You can plug in a U-Disk to play music simultaneously with the other port for fast charging your mobile device. ☆Amazing hands-free function, with CVC 6.0 noise cancellation technology applied, crystal clear quality sound, drive safely when answering a phone call. ☆This mini Bluetooth FM transmitter with dual USB charging ports, digital LED display screen and Built-In Mic, enables you to enjoy stereo music from your phone,Pad etc. in car via Bluetooth. 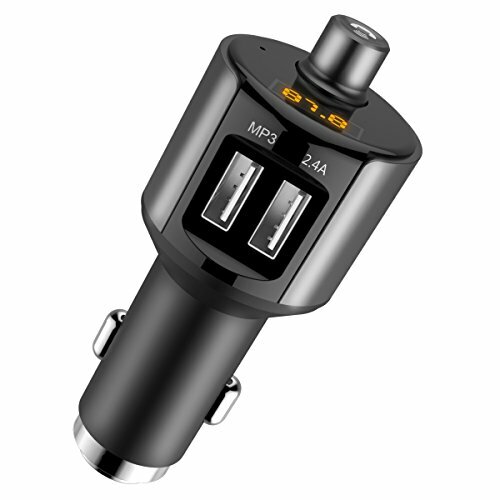 1.Plug in the Bluetooth FM transmitter. 2.Activate Bluetooth function on your mobile device and search for device name "HOCOE19" and connect(Input PIN:0000 if needed). 3.Rotate the multiple function button left or right to the pre-set frequency of your vehicle, now stream the music from your mobile devices. 4.Long press the multiple function button for 3 seconds to switch between Bluetooth / Flash Drive Mode if you want to play songs in your USB Flash Drive(U-Disk/Memory Card Reader/MP3 Player). You may have better stereo sound if you tune to frequencies between 106.0 and 108.0. Never dismantle it without the guidance of professionals. 【Smart Bluetooth FM Transmitter】Car charger Kit, stable FM signal with anti-interference function, enjoy stereo music from mobile devices. All-in-one function button, easy operation. 【Pair in Seconds and Memory Function】Just plug and tune in to the same frequency (range from 87.5 to 108 MHz). Now pair your phone or other devices via Bluetooth. ALL DONE! If in Flash Drive Mode, it will resume the playlist next time you start your car. 【Hands-free Call】Just a single click to answer an incoming call hands-free with the built-in microphone which guarantees a crystal clear sound quality thanks to the CVC 6.0 noise cancellation technology. 【Dual USB Ports and Quick Charging】5V 2.4A USB port guarantees you a much shorter time to fully charge your phone or other devices. 5V 1A USB port is for normal speed charging and also for Flash Drive mode. You can charge two devices at the same time with total 3.4A output current. 【Wide compatibility】Compatible with iPhone, iPad, iPod, Android Smartphone & Tablet and other devices equipped with Bluetooth function; Support U-disk or TF Card Reader(Up to 32GB),MP3 player; Support MP3/WMA format files for Flash Drive mode. Support all vehicles equipped with cigarette lighter. If you have any questions about this product by hoco., contact us by completing and submitting the form below. If you are looking for a specif part number, please include it with your message.